Astro and NextSat. (DARPA image) ST. LOUIS, April 19, 2007 - Satnews Daily - The two robot satellites in the Orbital Express mission have achieved their second historic first with the successful transfer of hardware�in this case a battery�between orbiting spacecraft. Launched March 8 from Cape Canaveral, Orbital Express consists of two spacecraft: Astro or the Autonomous Space Transport Robotic Operations from Boeing and NextSat, a prototype modular next-generation serviceable client spacecraft made by Ball Aerospace. Orbital Express is a Defense Advanced Research Projects Agency (DARPA) mission to test robotic refueling and robotic satellite servicing in space. This capability could extend the lives of commercial and U.S. government spacecraft by allowing refueling and satellite maintenance to be made on orbit. Following the historic transfer of fuel from Astro to NextSat a week after launch, the mission gained its second milestone recently when Astro used its three meter long robotic arm to transfer a battery to NextSat. 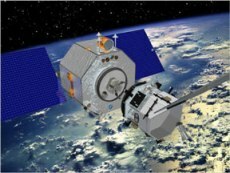 The battery was successfully integrated into NextSat's power system following the transfer. It marked the first time a spacecraft autonomously transferred hardware to another spacecraft using a robotic arm. The historic tests are the first in a series of planned demonstrations during the three-month mission. Astro's fluid transfer system supports typical client spacecraft configurations using either a pressure-fed (ullage recompression) or transfer pump system. In the ullage recompression demonstration, Astro transferred 31.97 pounds mass (lbm) of hydrazine to NextSat, satisfying the objective of 32 lbm. In the transfer pump demonstration, Astro transferred 2.2 lbm more than the 17 lbm target. The duo then conducted a pump fluid transfer from NextSat back to Astro. The demonstrations occurred at the lowest levels of spacecraft autonomy, which required several ground-based "approval to proceed" (ATP) confirmations. The team initiated ATPs to closely monitor and evaluate the operations. Future demonstrations will require fewer ATPs, allowing Orbital Express to conduct flight activities with increased autonomy. At the highest autonomy levels, no ATPs are required. "The Orbital Express team is accomplishing things that have never been done before in space," said George Muellner, president of Boeing Advanced Systems. "These achievements are the first steps toward developing a system that will extend the life and operation of various types of spacecraft." "Boeing believes autonomous on-orbit servicing and rendezvous proximity operations can be a vital element to enable a more operationally responsive space," said Alex Lopez, vice president of Boeing Advanced Network and Space Systems. Orbital Express team members include NASA, Boeing, Ball Aerospace, Northrop Grumman Space Technology, MacDonald, Dettwiler and Associates, the Charles Stark Draper Laboratory and Starsys Research.